Teams 2-5 are separated by only about three rating points. Teams 6-10 are separated by only about 2.5 rating points. Teams 11-17 are separated by only about 2.25 rating points. Teams 18-24 are separated by only about three rating points. 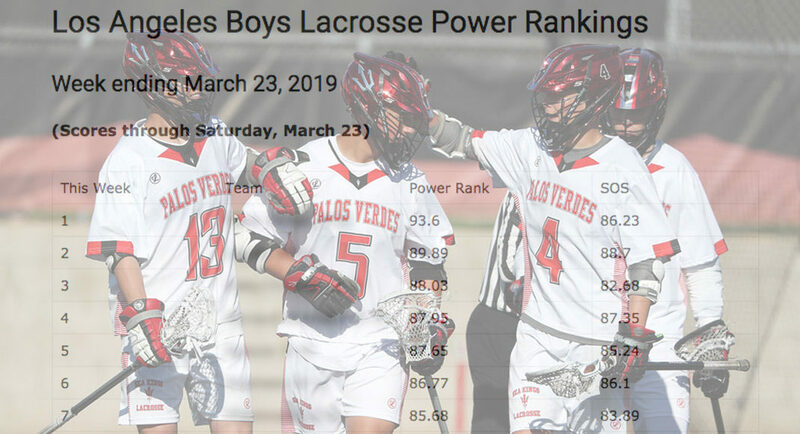 All of that suggests that overall quality and depth of boys lacrosse in the LA area is getting stronger. It also suggests some tough decisions come playoff time when the seeding committee has to determine which of the teams between six and 10 have earned home games in the first round, as well as which of the teams rated within a few points of No. 16 earn berths in the LA Championship Tournament and which should be seeded in the LA Invitational Tournament. Of course, it’s still March, and there still is plenty of lacrosse to be played, so a lot can change before seeding time. The complete MaxLax LA Boys Lacrosse Power Rankings are available here, with a MaxLax subscription. For an explanation of the MaxLax algorithm, read on: Developed by Michael Traub (Aliso Niguel ’13, MIT ’17), the algorithm processes the final scores of completed games to calculate a rating based on each team’s goal differential in competitive games. The objective is to determine what each game outcome teaches us about a given team, then reflect that in a numerical rating. An expected blowout that actually ends as a blowout is non-competitive and teaches us nothing. An expected blowout that winds up being close, or competitive, teaches us something. For these reasons, the algorithm relies heavily on the concept of competitive games, defined as those in which the score was close or was expected to be close based on each team’s relative power rating. These games reveal a team’s true quality and have much more influence over the ratings than non-competitive games. To hedge against teams receiving credit for running up the score in non-competitive games, the algorithm also evaluates how much a particular game should influence the ratings by calculating a “competitive factor” (CF). Games with a high CF influence the power ratings more than a game with a low CF. Have questions or comments about the new feature? Contact us at [email protected]. Editor’s Note: MaxLax is a community- and subscription-supported website whose mission is to spotlight lacrosse, its teams and its players in Southern California. This post is available to the public, with no subscription required. If you follow lacrosse in SoCal and enjoy our coverage, please consider supporting MaxLax with a subscription. I think what the tiers are clearly showing is a true separation in LAs lacrosse programs with older more established programs making up the top 10-12 and then the next 13-24 being made up of a different level of team. It truly makes the argument for two distinct divisions. Teams can be elevated and lowered based on their seasons outcome. You will probably see two maybe three divisions starting next year when lacrosse enters the realm of CIF playoffs.